Three questions from Santa: Have you been naughty or nice? Have you planned your weekend? Do you (or the small fry in your household) believe? Yes, the big, jolly man of mirth arrives on Capitol Hill this weekend and you have so, so many options to see him. No need to hit the suburban malls! Those Santas are mythic but the ones here on the hill are REAL. Well, real enough and none of them will break the bank. Besides, you have the wish lists you have to worry about and a mall on a weekend December day is not a place even the Grinch would recommend. This Saturday, December 1, from 10 a.m. until 1 p.m. you can visit with Santa, sip cider, write letters to Santa and create holiday crafts at the Frager’s Garden Center. You might even pick up a tree or trimmings. Ditto Residential and Ditto Tree Farm have set up a winter wonderland at the corner of 8th Street and Constitution Ave NE. This Saturday from 2-5 p.m. and each following Saturday through December 22 from 1-4 p.m. Santa will be hanging out amidst the trees. Check out their website — there’s lots going on for a vacant corner! Saturday and Sunday, December 1-2, from 10 a.m. – 2 p.m. Santa will hanging out at the Brent Elementary School PTA Holiday Sale. There will be music, trees and garlands for sale and your pets are welcome too! It costs $10 to snap a pic. Historic Congressional Cemetery hosts Santa on Sunday, December 2, from 10 a.m. – 3 p.m. For a suggested donation of $35, you will receive a personal thumb drive of all the images taken. Get on over to the website because they’re scheduling no more than 5 sittings per half hour. Both people and pups are welcome! If Santa at the cemetery seems a little morbid, head on over to the Brig. Rural Dog Rescue will be taking photos from 11 a.m. – 2 p.m. on Sunday. Make merry and take advantage of drink specials at a spot that’s kid and dog friendly! $10 donation suggested. If you’re hard at work getting those cards out this weekend, never fear. Santa’s sleigh comes down Pennsylvania Avenue next weekend too. On Saturday, December 8, from 10 a.m. – 1 p.m. he’ll stop by East City Books with his friend Ms. Frances of the Capitol Hill Cooperative Nursery School. A professional photographer will take photos for $20. That same Saturday, Santa will ALSO be down the street at Coldwell Banker from 11 a.m. – 2 p.m. Visitors can also take part in face painting, play I Spy with the traditional holiday windows and a fill up with a half-price kid’s meal courtesy of Mr. Henry’s. 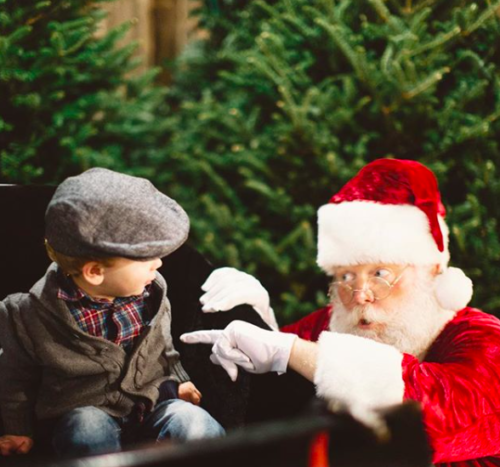 For a third Santa visit next Saturday, December 15, head to Taoti Creative on Barracks Row. Barracks Row Main Street will host a holiday party from 1 – 5 p.m. where parents can take Santa photos of children and pets and everyone can warm up with hot chocolate, coffee and snacks from Ted’s Bulletin. Face painting whiz Miss Patricia will be making magic on the little ones’ cute cheeks. Have a ho, ho, ho happy holidays! And don’t ever let me hear you say you have to head to the ‘burbs for a proper Santa photo!